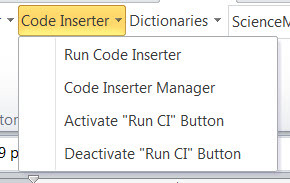 The Code Inserter Manager has a couple of new options that make coding, and editing, easier. The new functions are the ability to group codes (#1) and to have a code also apply a language (#2). 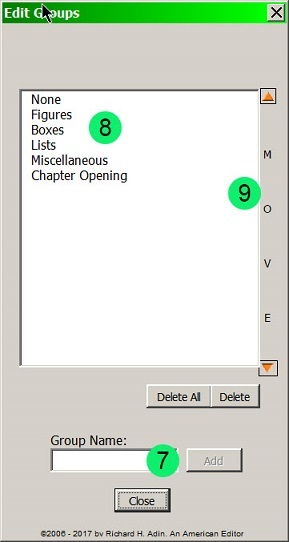 New to version 8 is the ability to organize codes by groups. To see groups that are available, click the down arrow (#3 below). The list of existing groups will be shown (#4). 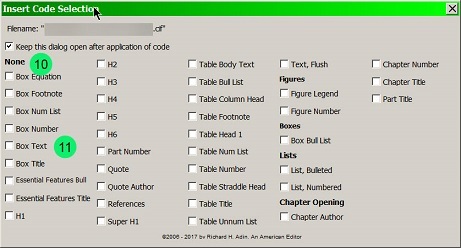 When a code has been assigned to a group, it is noted in the main field (#5). To create a new group or edit an existing group, click Add/Edit Groups (#6) to open the dialog shown below. It is likely you will need to scroll up to see this option. This dialog is also where you organize the order of the groups. To create a new group, enter the name in the Group Name field (#7) and click Add. To change or edit an existing name, double-click on the name in the main field (#8). The name will appear in the Group Name field (#7). Edit it and click Update. To reorder the groups, select a group by clicking on its name (#8) and then use the Move feature (#9) to move the group up or down the list. To delete a group, select the group and click Delete. Grouping lets you organize codes and to place them in an order that is convenient for you when applying the codes. As the image below shows, when the Code Inserter macro (rather than the Manager) is run, the codes are grouped (#10) and ordered (#11) according to your preference. Note that the group name appears (#10) with the codes that are part of the group listed under the group name (#11). Also new in this release is the ability to set the language for each code (#12 and #13). Select the language using the dropdown (#13). 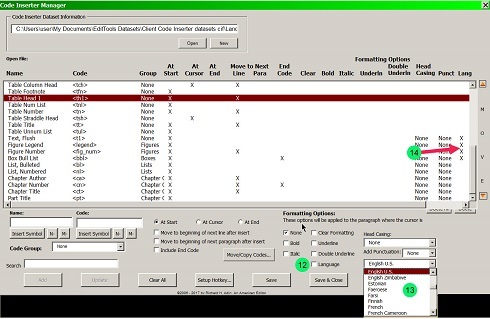 The list includes Word&apos;s list of available languages. The language you choose remains the default until you select another language. To include the instruction in a code, check the Language box (#12). If a language instruction is included in a code, it is denoted in the main field as an attribute of the code (#14). Formatting options — None, Bold, Italic, Clear Formatting, Underline, and Double Underline — have been added (#1). 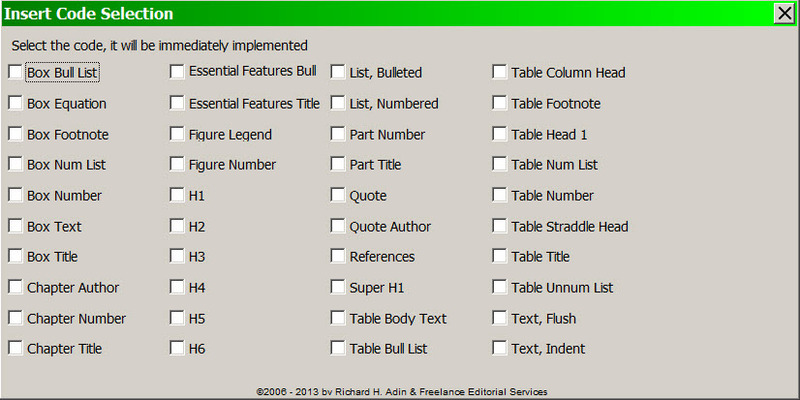 None adds no formatting to the paragraph or text to which the Code is being added; Clear Formatting removes any formatting that has been applied to the text being coded. The format options do not apply to the code; they apply to the text to which the code is being attached. <H3>Yesterday&apos;s walk in the woods? 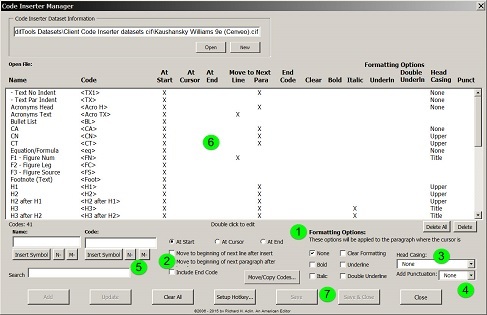 In addition to the previous options as to what should happen after the coding is entered, there is now an option to have the cursor move to the beginning of the next paragraph (#2). 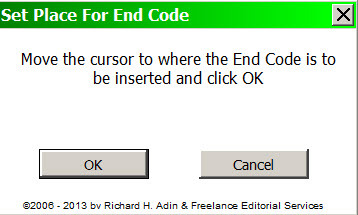 Using this option makes it easy to insert the next relevant code. Finally, the EditTools standard N- and M- buttons have been added (#5) to make it quicker and easier to insert these dashes if needed. As with the original version, your choices are displayed in the main field (#6). One last improvement, but a very important one: In the original version of Code Inserter, if you made a change using the Manager — whether adding a new code or modifying an existing one — the change was reflected only in the Manager, not in Inserter if Inserter was open when the change was made in the Manager. To have Inserter reflect the change, Inserter had to be closed and reopened. In version 7, after making a change using the Manager, click either Save or Save & Close (#7) to have the change immediately appear in Inserter. This change lets you keep both Inserter and the Manager open as you code a document and also lets you make on-the-fly changes — adding new codes, modifying existing codes — and having them available and applied immediately. 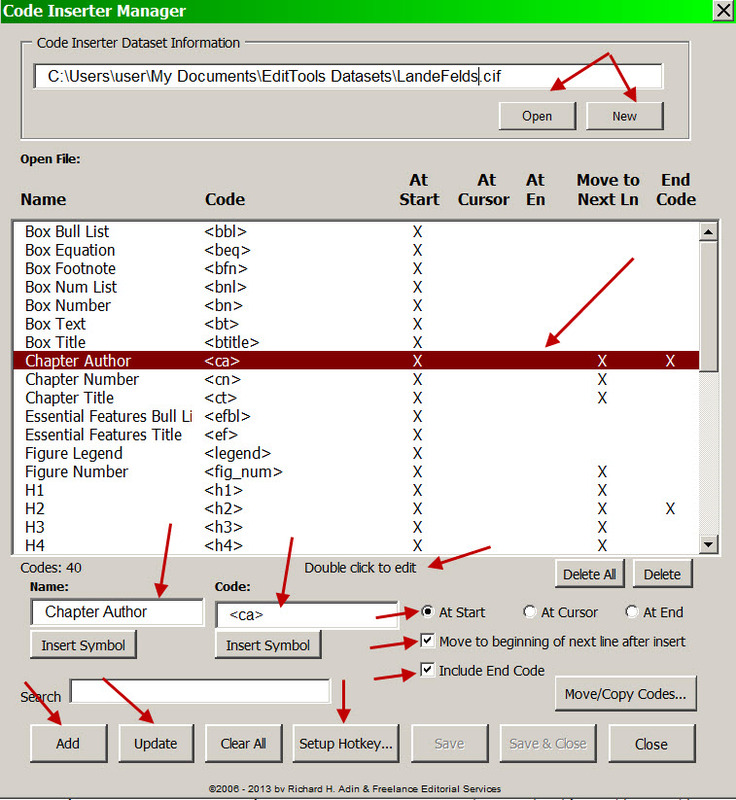 If the code is a new code, click Add to add it to the dataset; if you are correcting or editing an existing entry, click Update. Note the Setup Hotkey button. Hotkeys are a new feature for several of the EditTools macros. This allows you to assign a key combination to run the macro. 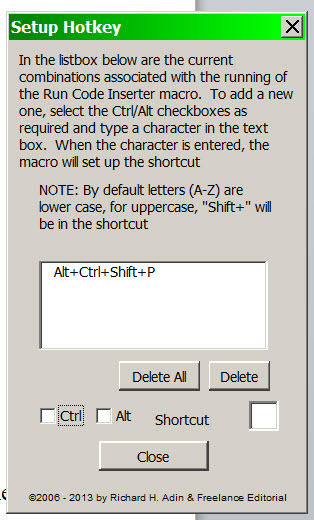 As shown in the image below, you can assign any keyboard combination to be the hotkey for this macro. NOTE: The hotkey runs the Code Inserter macro; it DOES NOT open the Manager. When you run the Code Inserter macro, it brings up the box shown below, listing all of the codes you have created alphabetically by name. Just click on a code&apos;s name or the checkbox next to the name, and the code will be automatically inserted according to the instructions you gave. With the Run CI button on the main menu bar, you click it, instead of using hotkeys, to run the Code Inserter macro, which is the dialog from which you choose the code to insert.